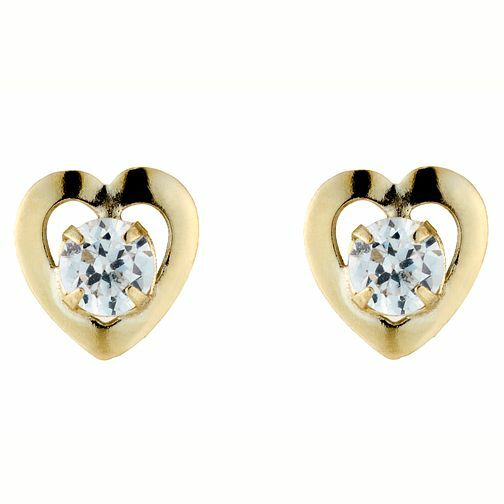 Pretty and sophisticated petite heart stud earrings in 9ct gold, set with cubic zirconia for extra sparkle. These flattering accessories will add the perfect finishing touch to every outfit. 9ct Yellow Gold Cubic Zirconia Heart Stud Earrings is rated 3.8 out of 5 by 10. Rated 1 out of 5 by Anonymous from Only one earring and no backs? How can a name like H Samuel send you one earring of two with no earring backs for the either the single earring or the missing one? Abysmal. Rated 5 out of 5 by Anonymous from Birthday present for my wife My wife loved these petite heart stud earrings in 9ct gold.